DCLead14 Spotlight: I’ve become a Rutgers Student Leader … what RU waiting for? Somewhere amidst the shrill 6am alarms, wading through snow to get to our destination, making ourselves peanut butter and jelly sandwiches before bedtime and fighting for shower time, I fell in love. I fell in love with how 40 random individuals (Site Leaders and Staff Partners too) from different walks of life, different interests and different personalities could leave those differences behind to serve one purpose: serving the vital, predominant issues of hunger and homelessness. I fell in love with how these individuals struck a perfect balance between work and play, sacrificed their needs for others and learned what I consider the most important leadership aspect of all: the ability to collaborate. The last three days have been a surreal blur. From our daily schedule of waking up, getting dressed, leaving to a work site, leadership activities, and then YSOP reflections with the program’s coordinators to finally wrapping up with small group meetings where we reflect on our activities for the day, this bunch has been through a lot. On day 1, we volunteered at the DC Central Soup Kitchen, where our tasks mainly relied on culinary skills. Most of us are now certain we can prepare a decent meal without burning the place down. We grated carrots, whisked mayonnaise, and then mixed all the ingredients together to create a beautiful carrot and raisin salad, from which were sent to elementary schools and homeless shelters. Day 2 was my favorite. Although my task consisted of what I considered menial: labeling boxes that would be sent to old age homes and homeless shelters, my site leaders assured me no task was menial when it boiled down to offering a helping hand. I thank my site leaders Gina and Kwame that praised every little effort of ours, encouraging us to give our best shot. The Site Leaders and Staff Partners deserve the highest praise for letting us be so flexible with our duties. “You’re all leaders!” is what they tell us. No amount of gratitude would suffice to express how great this trip has been so far! Day 3 was at Food and Friends, an organization where we were required to package groceries to send them off to shelters that mainly dealt with people that had illnesses that prevented them from eating all kinds of foods. We had to ensure they got a proper diet and appropriate nutrition. The workers there were especially courteous and so thankful when we dropped by; they seemed to love their jobs and I know see why. It’s so empowering. Day 4 (today and the final work day) involved environmentally-inclined service. We were made to spread mulch, pick trash and the most physically challenging task of all, pulling weeds! Jeanette, the woman that greeted us told me how her passion for environmentalism grew: she lived in a condo by the woods and upon one day waking up to see all the trees and plants she lived around were gone, she was broken. From then on, Jeanette was determined to make a change; she shut down her visual designing business, a move her friends and family thought was crazy. She sacrificed her comfort zone and source of income to accomplish what she was passionate about and my respect for her spirit is endless. She was inspiring and I see similar levels of inspiration, appreciation, determination and perseverance growing within us, little by little, every single day. I could see all of those combined on the night of day 3 when we had dinner with guests at YSOP. Everybody broke out of their comfort zones, served a self made dinner to them, playing board games while chatting. Somebody pointed out that we learned more from them than they did from us and that their experience, struggles and bumps along the way made their lives richer than ours in some ways. I have to agree with that. I’m incredibly proud of everyone’s open mindedness in embracing and absorbing so much that has gone on in these past few days. It was exhausting, overwhelming but I bet I could speak for most of the group when I say this was an experience we wouldn’t trade in a million years. Even if it meant waking up past 7am, being able to take showers whenever we wanted and not waking up to the obnoxious rooster alarm (whose alarm is that anyway?!). I’ve become a Rutgers Student Leader … what RU waiting for? 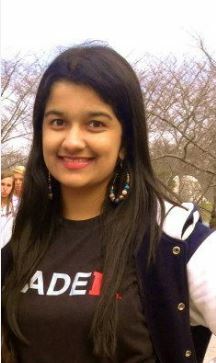 Rhea Pillai is a 19 year old Journalism student at Rutgers University, hailing from New Delhi, India. Her passion for community service and volunteer work in the past has paved way for her to work at animal shelters in India, orphanages and a school for children with special needs in Ghana and very recently, the opportunity to serve the hungry and homeless in Washington D.C.
She is also actively involved with the International Students Association on campus and enjoys blogging and traveling the world. This Post was tagged alternative break, DCLead14, first year, leadership. Bookmark the permalink.